So I think going off my meds was a bad idea. The paranoia of my house catching fire is back along with other fairly irrational thoughts. You forget you have those when your medicated. So back on meds today before it gets out of hand. This entry was posted in Uncategorized and tagged anxiety, bipolar, depression, life, medication, mental health. I have so much worry and am in so much pain. This time physical pain add I hurt my hip. I went to Drs and am waiting for my steroid script. Wal-Mart pharmacy is taking forever. I’d go run an errand but I got a good parking spot and well I can’t walk very good. Please pray send good vibes for a quick recovery. I can’t miss anymore work. Ok as I was writing the above I got called to get my script. My hip feels better but I’m afraid it’ll stiffen up when I go to bed. We shall see. I’m I this weird state right now of wanting to spend money and regretting all the money I’ve wasted. Luckily I don’t have any to spend right now or I would I’m sure. 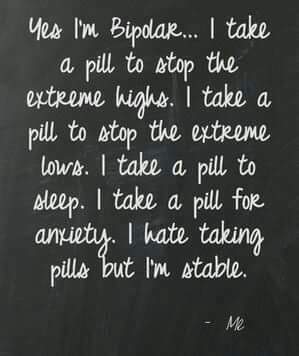 I have a confession I haven’t been taking my meds. It seems when I take them I get more depressed. I don’t have insurance right now so I haven’t made it a priority to take. Other then the spending money… I feel better not taking them. Is that foolish? This entry was posted in Uncategorized and tagged anxiety, bipolar, depression, life, medication, mental health, pain. I had a good therapy session. I told him I wanted to find joy in life. He asked if I can feel any emotions due to my meds. I said not really. Occasionally I have felt rage or serene. He said I need to fake it to make it. When I have an inkling of the feeling I need to act on it. Like when I’m in a rage stomping my feet. Of course nothing too over the top. This will train my brain to get past the need fog and engage. I’m working on faking joy to make it in my life. So far I’ve been positive and upbeat. I’m even on call this week and I feel good about it. Though the nagging in my mind days give it a few days. This entry was posted in Uncategorized and tagged anxiety, bipolar, borderline personality disorder, depression, emotions, joy, life, medication, mental health, mental illness, rage. I’ve been very vocal in my love hate relationship with medication. I feel I’m still over medicated as I can’t cry but I also feel it’s helped me have better days. I do wish I could go med free but I think those days are over. This entry was posted in Uncategorized and tagged anxiety, bipolar, borderline personality disorder, bpd, depression, life, medication, mental health, mental illness. ​My buspar was increased. I think it’s kicking in as I have this false sense of no anxiety. Like it’s there then when I go to figure out why it’s vanished. Does that make any sense? I’m still plugging away at work and my suicidal ideation has dissipated for now. I have therapy tomorrow and I’m going to ask him to help me figure out why I can’t tell myself no. … No to eating and no to spending money. No to waiting on anything. If I say no it becomes an obsession. Why is that? This entry was posted in Uncategorized and tagged anxiety, bipolar, borderline personality disorder, depression, life, medication, mental health, mental illness, work. As I sit here vaping and drinking coffee I realize I’m anxious to be meeting my new pdoc. It’s our first meeting so I’ll have to go through my history. Ugh. And I really want to try the anti binge eating medication but I’m fearful he’ll think I’m drug seeking. I just need help. Plus I’d like my klonopine back. Sigh. I have an hour and a half to wait. Boo. I just keep telling myself it is what it is. I’ll make due regardless.